This is third person action in armored vehicles, unique and addictive in the strategy game genre. Tanks of Battle: World War 2 follows history and takes you to some of the most important and epic battlefields of world war 2. Take the role of a tank commander and make sure your tank crew is up for the task. Roll your tank trough blasting panzers, shermans and antitank guns. Tanks of Battle: World War 2 is a fast past action shooter that makes the adrenaline going. Go for the slow and tactical approach or go in all guns blasting, fight of the waves of enemy tanks in the endless mode. 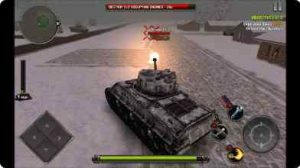 Tanks of Battle” World War 2 offers the player two game modes the campaign that takes you to all those famous battlefields, or the endless mode where you get to fight off hordes of enemies. See how far you can go in this tank game mode, repair your tank for the next wave. Get new supplies, like air support and more to get as far as possible. And rule the global leaderboards in your tank class! So can you handle this intensity can you complete all the missions? A real combat experience for young and old. Explore the world of tank combat during historical correct world war II tank battles. Extremely addictive gameplay from start to finish in this battle tank simulator game. A big varied of powerful weapons that could be used in any tank battle situation!